A widespread (EOO 20 128 km²), but highly localized habitat specialist (AOO <50 km²). It is still fairly common in spite of widespread, ongoing habitat degradation, estimated to occur at between five and 10 locations, but is likely to continue to decline. Seasonal pools and pans on clay soils, rarely in sandy soils in streambeds. Plants are often floating in standing water. 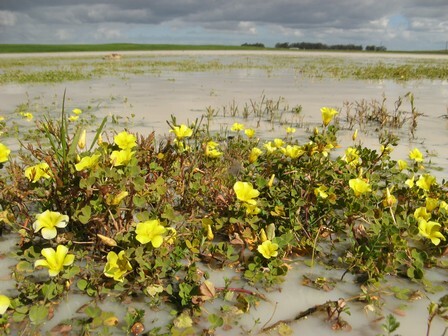 Areas surrounding this species habitat is extensively cultivated, however, seasonal pools are not generally ploughed, except in a few instances where pools have been filled in. The most severe causes of degradation of vernal pools in the Western Cape and on the Bokkeveld Escarpment is heavy overstocking with livestock, which leads to overgrazing and trampling of sensitive wetland systems, as well as eutrophication due to fertilizer runoff, which is aiding the spread of alien invasive grasses. 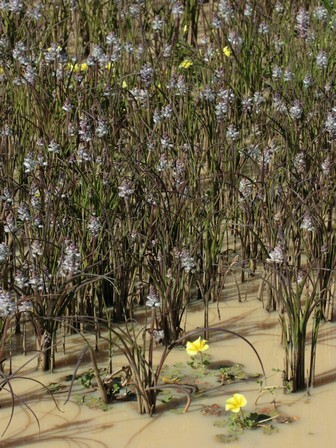 Dense alien grass infestations are outcompeting native species in many wetland systems. None of this species' habitat is currently formally protected. This species occurs in isolated, scattered subpopulations confined to suitable habitat. It is however locally abundant, and subpopulations are large. It is currently known from nine existing subpopulations, and many recent records indicate that it is still fairly common in spite of extensive habitat loss and degradation. Salter, T.M. 1944. The genus Oxalis in South Africa: a taxonomic revision. Journal of South African Botany Supplement 1:1-355.